The “HF House” concept has originally been presented in the STANAG 4538 specification (included as part of MIL-STD-188-141D Appendix C) as a set of standards for HF communication. It attempts to align the NATO standards with the US MIL-STDs to promote interoperability. The HF House covers the lowest levels of the standard OSI Network model. It provides as a minimum baseline for achieving HF communication interoperability. Interoperability can only be achieved via standardization, followed-up by interoperability exercises between vendors. An update to the HF House is required as HF Standards are continuously being developed. The addition of Wideband HF Modem, Wideband ALE and Wideband ARQ standards to the HF House concept is depicted below. The updated HF House is named the “Wideband HF House”. The Wideband HF House shows the second (2G), third (3G) and fourth generation (4G) standards. The updated house also highlights the possible interactions between the Modem, ALE, ARQ and 2G, 3G & 4G standards. 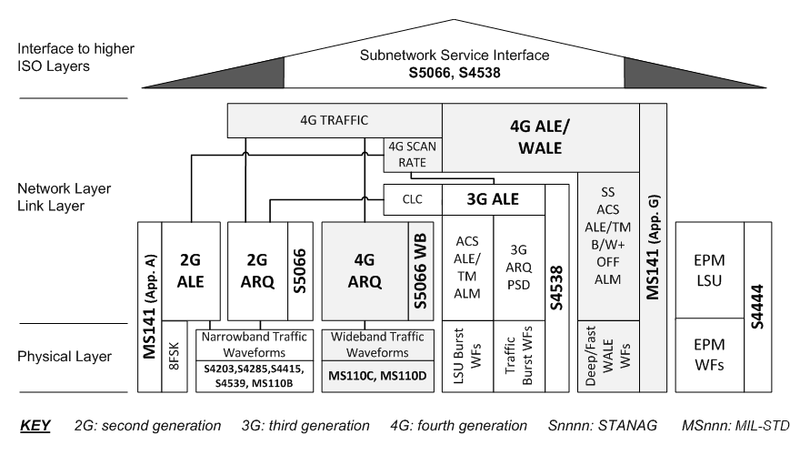 4G ALE systems can set up links for legacy narrowband or wideband traffic. 4G ALE systems are backwards compatible with 2G/3G ALE. To this end 4G ALE/WALE supports a scan rate compatible with 3G systems. STANAG 5066 WB (Edition 4*) is the appropriate ARQ for MIL-STD-188-110C, D.
System Integrators, Radio Makers and End Users often require on-site integration assistance at short notice during the development of new products or the commissioning of new HF and VHF data communication systems. RapidM has a pool of engineers experienced with integration assistance. RapidM has a large pool of specialists skilled in the area of low-power, high-performance data communications hardware, platform and software development. We have considerable R&D capacity to develop high-speed, wideband and BLOS communications solutions. Over the years, RapidM has acquired a large amount of specialist knowledge and experience in system architecture. System integrators, equipment manufacturers and resellers can leverage this experience to produce well thought-out systems and solutions meeting international standards.